Antibody drug conjugates (ADCs) constitute a niche market, but hold the promise of carving out significant revenues, particularly in oncology. In development since the 1980s, these tightly targeted molecules are the subject of renewed interest, driven by the development of new linkers, improved cytotoxic payloads, and their ability to reduce side effects. Their appeal lies in the ability to link potent cytotoxic agents to antibodies with improved linkers, enabling toxic therapeutics to be tightly targeted and thereby minimize dose-limiting side effects. “ADCs won’t work for every target—they need targets that internalize themselves to destroy DNA,” points out Jason Chew, analyst, Chimera Research Group. According to Daphna Halpern, director of oncology at Citeline, “Currently, about 100 ADCs are in active development, including 39 in clinical trials—up from 30 in June. With 60 percent in preclinical development and 30 percent in Phase I clinical development, the bulk of the work is quite new.” The significant uptick in interest in the past year bodes well for this therapeutic segment. ADC development is dominated by major oncology players in multiple collaborations with smaller firms. “There are quite a few companies in Phase I development, and many are in preclinical development with just one drug,” Halpern says. Among small companies, “Ambryx Biotechnology also is pretty interesting,” Chew adds. “The company feels out a random number of drug payloads to bind to an ADC. They can’t get the exact number they want on every molecule. Currently, Ambryx is trying to determine the optimum number.” The firm has three products in preclinical development. The technology targets tumor-specific antigens, delivering a cytotoxic agent, a biodegradable linker, and a mAb, diabody, or ScV (single chain variable) fragment with antigen-binding affinity to the surface of a tumor cell. The cell then internalizes it, degrades the linker, and releases the payload of up to eight drugs. Because these ADCs are designed to treat gene-mediated diseases, they bind to genomic DNA and recognize discrete sequences of base pairs. Spirogen has one oncology drug, SG2000, that entered Phase II trials in 2010 for ovarian cancer, and agreements with Genentech and ADC Therapeutics. Spirogen has a multiyear research and licensing agreement with Genentech to develop ADCs as anticancer agents using Spirogen’s pyrrolobenzodiazepine drugs and linker technology. In March, Celtic Therapeutics formed ADC Therapeutics to target ADC technology against prostate, renal, breast, lung, and blood cancers. Ten development pipelines were established, and an initial budget of $50 million was set, with the goal of taking one to clinical trials within two years and achieving multiple Phase II proofs of concept within five years. Furthering that objective, in July 2012 it signed an agreement with Cancer Research Technology (CRT), the commercial division of Cancer Research UK, to develop ADCs combining its warheads and linker technology with CRT’s antibodies and peptides. Called Fleximer®, the biodegradable polymer system can attach to a plethora of novel, stable linkers that, in turn, attach to a range of antitumor payloads. Those linkers then attach Fleximer to an antibody or antibody fragment to create an ADC. The customizable system is stable in the bloodstream and releases the payload only after it is internalized by the tumor cell. Mersana says its approach offers better cellular penetration by delivering payloads beyond antitubulins (significantly increasing drug payloads) and has the potential for use with mAbs and other antibody fragments or targeting mechanisms. Mersana is working with Pfizer, Adimab, and Endo Pharmaceuticals to make new ADCs using each company’s antibodies, and also is developing its own drug pipeline to address unmet oncology needs. In March, Mersana announced a collaboration with Endo Pharmaceuticals that could exceed $270 million in milestones and royalties on global sales. Under the agreement, Endo will use Fleximer to develop ADC candidates against a single cancer target, with the goal of developing safer and more efficacious therapies. Responsibility for product development, manufacturing, and commercialization rests with Endo. Mersana’s own pipeline includes a best-in-class tecan conjugate in a Phase Ib lung cancer trial, and a first-in-class anti-angiogenic conjugate in a Phase I trial for patients with refractory, advanced solid tumors. The latter compound, XMT-1107, has been licensed to Teva Pharmaceutical Industries for distribution everywhere but Japan, where Mersana maintains the rights. 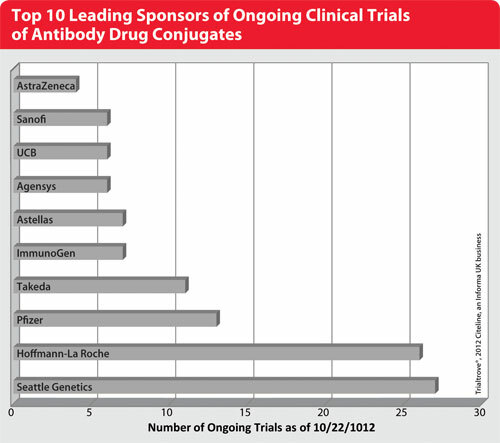 Seattle Genetics is another player in the ADC field, with 27 compounds in development. It developed the first new drug since 1977 to treat Hodgkin lymphoma (HL). Called Adcetris™ (brentuximab vedotin), it was approved August 2011 for both HL and a rare lymphoma known as systemic anaplastic large cell lymphoma (ALCL). Further trials for related indications are under way in collaboration with Millennium: The Takeda Oncology Company. The company also is engaged with collaborations with 10 other companies: Abbott, Agensys—a division of Astellas, Bayer Healthcare Pharmaceuticals, Celldex Therapeutics, Daiichi-Sankyo, Genentech, Genmab, GSK, Pfizer, and Progenics Pharmaceuticals. In June, Seattle Genetics expanded its Phase I trials of ASG-5ME, a fully humanized mAb that targets SLC44A4 (AGS-5), which is upregulated in many epithelial tumors. Trials for prostate, pancreatic, and gastric cancers are under way. Two months later, in August, it launched SGN-75, a Phase Ib study for renal cell carcinoma using its anti-CD70MAb and a monomethyl auristatin F payload, in combination with the mTOR inhibitor everolimus. Another trial also is under way, dubbed ASG-22ME. This ADC targets Nectin-4, which is expressed on cancers of the bladder, breast, lung, and pancreas. Its R&D work focuses upon developing mAbs and ADCs with novel specificities and activities against proteins that are highly expressed on tumor cells. Antibody engineering work is ongoing, both in antibody humanization and defucosylation. Early data from an ADC based upon using small molecule inhibitors of fucosylation shows antitumor activity and good dose tolerance. Seattle Genetics says this indicates the therapeutic may have promise as a syngeneic tumor vaccine. The company’s pipeline supports its early-stage auristatin-based ADC platform with PBDs—a class of DNA-crosslinking agents licensed from Spirogen—and an engineered systeine mAb that increases linker stability and the uniformity of drug loading. The latter enables site-specific conjugation of two cytotoxic compounds per antibody. Preclinical programs include an integrin expressed on multiple solid tumors, including cancers of the lung, pancreas, head, and neck. “Genentech has licensed quite a few ADCs,” Chew says, “and collaborates with ImmunoGen, Seattle Genetics, and several others. Genentech also is trying to develop its own internal program.” Genentech has 26 ADCs in its pipeline and eight in the clinic, all targeting cancer. According to Halpern, Genentech’s trastuzumab emtansine (T-DM1) is quite promising. Developed using ImmunoGen’s linker technology, the ADC inhibits Her2 signaling and delivers its payload directly to Her2-positive cancer cells. Phase III trials show a clinically meaningful improvement in overall survival compared to capecitabine and lapatinib. The company recently filed applications for marketing approval in Her2-positive metastatic breast cancer with the FDA and EMA. ImmunoGen has 18 projects in development from preclinical to Phase III stages, and others in earlier phases, giving it one of the largest pipelines in the ADC space. Of those, two are in Phase III and six are in Phase II development. Its linker technology, called TAP, provides a portfolio of engineered linkers to control release inside cancer cells. The company’s TAP technology is featured in collaborations with Sanofi, Roche/Genentech, Eli Lilly, Novartis, Amgen, Biotest Pharmaceuticals, and Bayer Healthcare. Pfizer has approximately one dozen ADC programs in development, including the first ADC to target cancer stem cells. The company is interested in expanding its platform through collaborations to develop ADC platforms, novel payloads, linkers, and conjugation sites. One of its most advanced programs involves inotuzumab ozogamicin (CMC-544) as an investigational ADC targeting CD22. Phase III studies are under way for non-Hodgkin lymphoma and acute lymphoblastic leukemia (ALL). Phase II studies involve large B-cell lymphoma and non-Hodgkin lymphoma. A Phase I study targets ALL.